Our conservatories are extremely modern which have been expertly designed to ensure that they will keep you warmer in the winter period while cooler in the summer. Our glass is specially premeditated to reflect sun rays away, which aids on keeping the room cooler. Meanwhile heat is reflected back into the room via a special coating within the glass, which maintains room temperature during the winter months. To enhance the glazing efficiency, there is an air cap between each pane of glass, which is Argon gas filled, which prevents cold air entering your conservatory, reducing energy bills, meaning that you will require less radiators or conservatory heaters, to heat up your conservatory. Our conservatories are available in a wide range of shapes and styles, each conservatory is designed with full consideration of your property type. This ensures that your conservatory will not only look good, but feel right too, based on your Peterborough home. All conservatories are fully bespoke in design, your conservatory area will be measured, designed using our innovated CAD conservatory software, then manufactured and installed to the highest standards. Though each conservatory is bespoke in design, we generally use a configuration of the general conservatory styles list below. 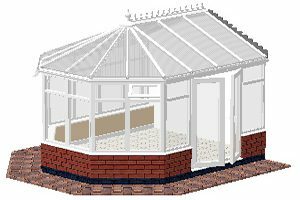 The P-Shaped Conservatories are designed using a combination between the Lean-To conservatories with the Victorian conservatory. The P-shaped conservatory can be manufactured with either three or five facets. When the Georgian style conservatory is combined with the Lean-To conservatory, then the shape is altered and becomes an L-shaped conservatory instead. The P-shaped conservatory is ideal when separating two living spaces. This is usually illustrated with a lounge and a dining area, or often as a children’s play room. 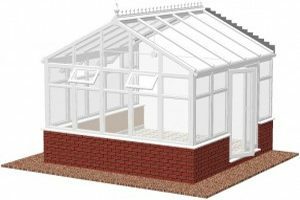 The P-shaped or L-shaped conservatories are ideal for larger detached properties, as these conservatories are generally the larger impressive structures, which may look out of place in a small garden. The P-shaped conservatory roof can be designed with either three or five segments in style, the roof can be either returned using a hipped conservatory roof or a Lean-To. Victorian Conservatories are extremely elegant and spacious in design, offering a huge view into your garden. The Victorian conservatory is not only the most popular choice of conservatories, but it will also suite any Peterborough home style. If you ask anyone to describe what a conservatory looks like, the Victorian conservatory springs to mind. The Victorian conservatory incorporates a bay window at the front, a large pitched roof with an ornate ridge. Designed with modern materials such as uPVC or aluminium, which will be built to last. Victorian conservatories normally have three-facets, with a bay front window encompassing three main windows. While the five-facets, encompass five main windows, for increased space as well as aesthetics. Edwardian Conservatories remain one of the most popular choice of conservatories in Peterborough. With the rich rectangular footprint, maximises the overall floor space, allowing furniture to be easily positioned. Edwardian conservatories are often known as the Georgian conservatory, whether originated from back in the 18th century when conservatories first become popular. 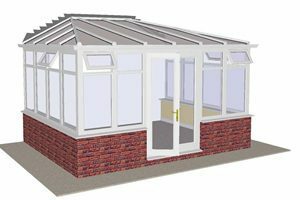 The Edwardian conservatory has a symmetrical design, clean lines, with a square corners, combined with a sloping front roof. The central ridges create a vault feeling within the roof space. Combined with our beautiful glass conservatory roof, natural light is flooded into the room, offering spacious, airy, relaxing room. On occasions when there are height restrictions, such as a bungalow, then a double hipped version of this Edwardian conservatory provides a box gutter on the house wall, where the roof slopes back towards the house. The Lean-To conservatory, often known as the Mediterranean sunroom, has a low pitched form, with a glass roof, providing the most practical style conservatory. The Lean-to conservatory is the simplest style conservatory, which makes it the most popular choice for modern style properties. The Lean-to conservatory is ideal for properties which have restricted space under the eaves such as bungalow, or when restrictions make it difficult to accommodate another conservatory type. This is due to the roof pitch on the lean-to conservatory can vary, where a shallow pitch can fit under a low bungalow roof, or a steep roof for a terraced style house. Lean-to conservatories are also known as sunrooms, bringing a Mediterranean feeling to a home, drawing the winter sunlight in to the room then converting this light into heat via the conservatory glass roof. This conservatory is the simplest of all styles, providing maximum space in a striking style. The Gable End conservatories are irregular in relation to the Edwardian conservatory, though they are so different in design, they do however share the same basic square or rectangular footprint. But instead of the typical Edwardian conservatory roof sloping back, the Gable-End conservatory roof is upright, just like the gable end of a typical house. The marvellous flat gable front, maximises every possible bit natural light which flows into the conservatory. 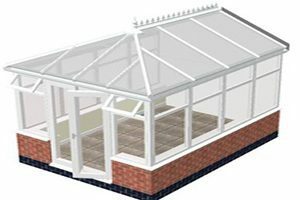 The Gable-End can be manufactured into a variety of conservatory styles, such as the sunroom or horizontal conservatory styles. On occasions where the traditional conservatory design cannot be structurally practical or visually correct. 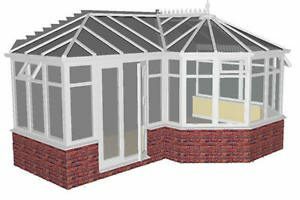 On these circumstances our professional conservatory designers, can create using our sophisticated CAD system, to design a bespoke conservatory, which will not only be safe in structure, but will best suit your specific requirements and needs. Our highly trained conservatory designers and conservatory fitters, can adapt your bespoke conservatory with many additional options such as; including extra wide box gutters, aluminium shroud, lantern roofs for additional lighting, also a huge range of bi-folding doors.